For sixteen-year-old Charlotte Reynolds, aka Charlie, being raised by a single dad and three older brothers has its perks. She can outrun, outscore, and outwit every boy she knows- including her longtime neighbor and honorary fourth brother, Braden. But when it comes to being a girl, Charlie doesn't know the first hing about anything. So when she starts working at chichi boutique to pay off a speeding ticket, she finds herself in a strange new world of makeup, lacy skirts, and BeDazzelers. Even stranger, she's spending time with a boy who has never seen her tear it up in a pickup game. To cope with the stress of faking her way through this new reality, Charlie seeks late-night refuge in her backyard, talking out her problems with Braden by the fence that separates them. But their Fence Chats can't solve Charlie's biggest problem: she's falling for Braden. Hard. She knows that it means to go for the win, but if spilling her secret means losing him for good, the stakes just got too high. I honestly didn't know what I was getting into when I started this book. It seemed sweet enough and the summery made me smile. So of course, I picked it up. I am so glad I did! I actually listened to it on audbile.com. Shannon McManus did an incredible job reading this. She was consistent with each character's voice (which is hard sometimes), and she made it flow so naturally. If I haven't said it before, I really enjoy audio books. Being able to listen to a book while also doing other things, like cleaning or cooking, or grocery shopping, is perfect! Cause honestly, all I want to do is read. On to the actual book itself. Charlie was such a sweet character. I loved her relationship with her brothers and her father. I loved how she was surrounded for all these boys and could easily "be one of the guys" but still have a feminine side she hadn't discovered yet. I know I've said how much I like family in a book and I'll say it again. Having families actively involved in books just makes it all the better. We all know how families are, and each family has it's own quirk and traditions. A family in a book shouldn't be any different. Incorporating a family into a novel only enhances the experience and relation you have while reading. It's as much about what happens around the character as it is the character. At least, that's how it should be. Charlie's brother's where hilarious and everything a brother should be. They were protective, teasing, loving, hard on her, but still loved her more than anything. Then you have Braden, the brother's best friend that of course is volun-told (not volunteered, but volun-told) into becoming her fourth brother. But as we have seen before in so many other contemporary romance novels..... this never ends well. Feeling development is inevitable and only a matter of time. One of the best things about her brother's is that they make a list of all the qualities of guys she isn't allowed to date. It's hilarious! Some of the best moments in the book for sure! However, this book wasn't completely focussed on the romance. Romance was a big part of it, but it was mostly a self discovery book. It was done so well that the self discovery wasn't shoved down your throat like caught syrup that you don't want to take. It was presented to us slowly and build up in importance. It was extremely well done. Thank you Kasie West! In On The Fence we got to see this journey that Charlie goes on. We were able to experience her finding out the truth about who she is and what happened in her past. This was a fantastic book and one I highly recommend! Leave a comment below about what you thought of On The Fence, or of any book recommendations you may have. "One think my mother never knew, and would disapprove of most of all, was that I watched the Garrets. All the time." The Garrett's are everything the Reeds are not. Loud, messy affectionate. And every day from her rooftop perch, Samantha Reed wishes she was one of them... until one summer evening, Jase Garrett climbs up next to her and changes everything. As the two fall fiercely for each other, stumbling through the awkwardness and awesomeness of first love, Jase's family embraces Samantha- even as she keeps him a secret from her own. Then something unthinkable happens, and the bottom drops out of Samantha's world. She's suddenly faced with an impossible decision. Which perfect family will save her? Or is it time she saved herself? A transporting debut about family, friendship, first romance, and how to be true to one person you love without betraying another. 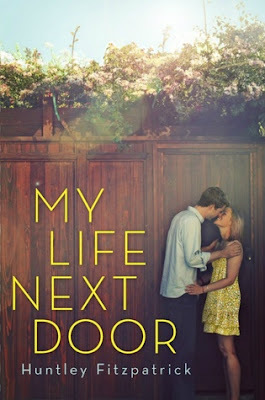 My Life Next Door by Huntley Fitzpatrick was so sweet. There was the "Boy Next Door" feel, where there is this guy that can potentially be a love interest. But then you have the strict, unrealistic parents that makes it so much harder to be yourself and do what is best for you. While reading this book, I knew what my heart wanted and I knew how I wanted the story to end, but there was so much going on in this book. Everything about it was great! Well.... almost everything, but I don't want to give the whammy away. There is something about having such a strong family presence in books that just makes me smile. I love my family and in my life, family is a big deal. To have that same family importance in a books is always a welcomed element in a story. It's also one that I don't find often. Usually a novel will focus solely on the two protagonists and maybe a very selected few outside characters. But when I do find a book that incorporates that family element, it awes me. In My Life Next Door, the Garrett family was a family. Not just a family but a force. Each Garrett had a strong personality and they all brought something new to the story. As exciting as the family element in a story, having children also involved is something that just makes me smile. The children in this story were extremely present in Samantha's story. As much as children can bring good things into a story, it can also kill the story. But Fitzpatrick wrote the children in a way that wasn't ridiculous and too in your face. Although they were there, they were subtle. Well as subtle as children in real life can be. Regardless, she incorporated them nice. I really enjoyed this book. As much as it was about first love and family, it was also about finding yourself. But that finding yourself element wasn't suffocating. You know how some "finding yourself" books can almost choke you? I mean, you are reading a book to escape the pressures of real life. You don't want to be stressed out while reading a book. Sometimes the "finding yourself" books do this. My Life Next Door, wasn't like that. Although the element was there, it wasn't overbearing. What may have gotten me to like this book as much as I did was the broken characters, both physically and figuratively. This book wasn't all sunshine and rainbows and I appreciated that. I liked that Samantha's friend and her family hall had broken things about them, whether their thoughts or their actions, they each had something about them that needed fixing or reflecting. The whammy of this book had my heart racing and near tears. "How could this happen," I kept asking myself. You'll know what I'm talking about when you get there. My only advice is to KEEP READING! Five stars for this book! Loved it and I listened to it on audio. The narrator was perfect! You could really feel how Amy Ruminate stepped into Samantha's head and howe she was able to relate to Sam. The audio was incredible and if you don't have time to read, the audio is definitely worth it! Leave a comment below about what you thought of My Life Next Door, or of any book recommendations you may have.